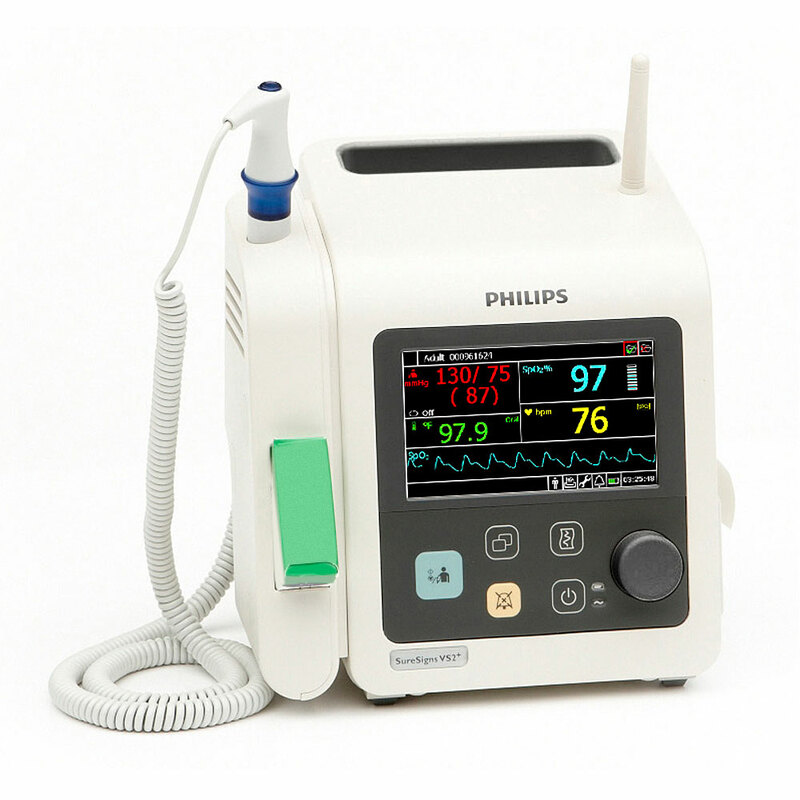 Philips SureSigns VS2+ Vital Signs Patient Monitor. Affordable patient monitoring in a portable, reliable platform. Simple to use, and easily integrated into an existing network. The VS2+ can provide direct communication with your facility's Electronic Health Record (EHR) system with programmable bar-code scanning technology, eliminating time consuming transcription, and reducing transcription errors. The VS2+ is designed to make spot checks on adult, pediatric, or neonatal patients simple and efficient. You can obtain oral temperatures quickly, in just 4 seconds. Initiate a blood pressure check in a snap with the large, one-touch NBP button. Body temp, pulse oximetry (including pleth wave), heart rate, diastolic, systolic, and mean arterial pressure (MAP) are easily visible and distinguishable on the bright, full-color LED display, an industry first. The VS2+ patient monitor has been designed for practicality and functionality. For ease of downloading data, the VS2+ features LAN/serial data export in HL7 format. There is also a USB port for data export and software upgrades. It has a lithium-ion battery as an internal power supply, and an AC power cord for operation and charging. Philips' SpO2 technology is compatible with a wide range of sensors. All of this packaged in a rugged housing with a sturdy handle for easy portability. Wireless configuration includes an internal wi-fi 802.11 a/b/g option. There is also an integrated recorder/printer available. Recorder/printer includes 2 rolls of paper.